When the World Cup rolls into a city, the most tangible and lasting result is the stadium it leaves behind. Across the globe, the tournament has deposited fantastical structures — saucers, bowls, houses on stilts, each one a statement piece or architecture designed to wow the travelling crowds and cameras in the brief window afforded by the games. Often these are brand new edifices, thrown up in a few years, outside of city centres that afford little space for extravagant construction. 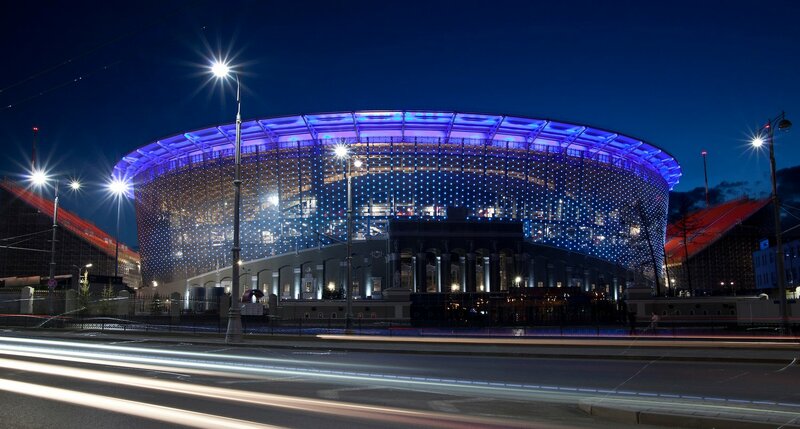 In Yekaterinburg, however, the demands of hosting have produced something unusual even by World Cup standards: a literal layering of sporting and architectural history, as the city’s Central Stadium has become the Yekaterinburg Arena. The first sporting facilities on this site were consecrated in 1900, when a velodrome and athletics track was opened by a local merchant on what was then an empty field. The first football matches to be held in the Urals region were played here in 1913, and later credited with popularising the sport among locals. In 1925, a wooden football stadium holding 5,000 spectators was thrown up, bearing the name first of Lenin, and then of local sports society Metallurg Vostok. This survived the Second World War before finally being replaced by the Central Stadium in 1953, the year of Stalin’s death; by this point the football teams of the Urals had grown in popularity to the point where the wooden stadium was dangerously insufficient. 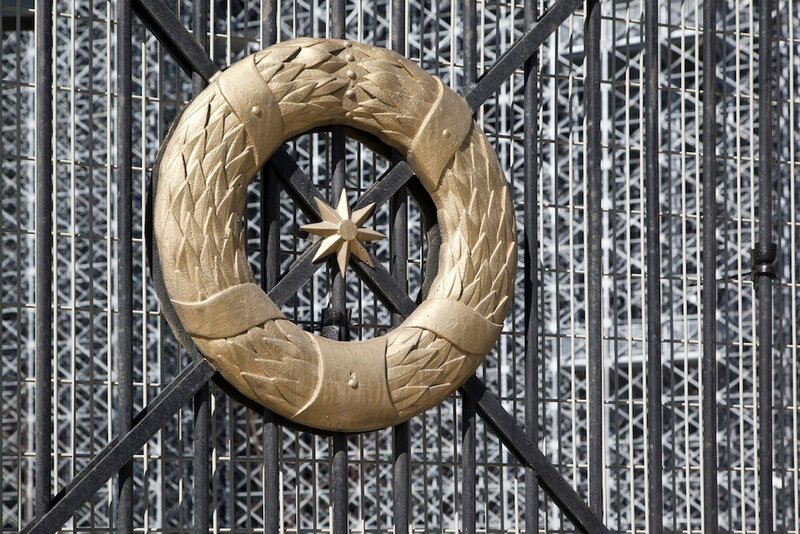 Under the supervision of architects Vasiliev, Nikulin and Vladimirsky, German prisoners of war worked for four years on the new building — a grim reminder of Yekaterinburg’s and other industrial Urals cities’ critical role in winning the war for the Soviet Union. 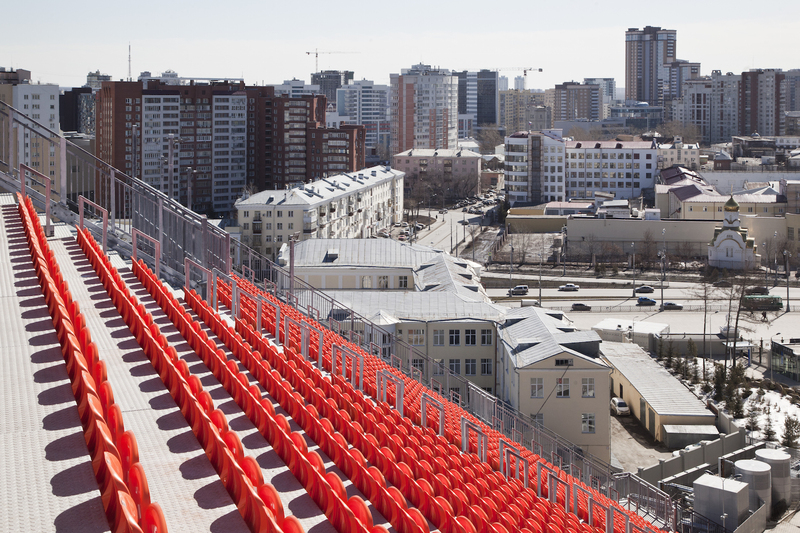 Holding 27,000 spectators and equipped with training facilities and a hotel, the new stadium was one of the USSR’s finest, especially renowned for hosting winter sports, and — after local team FC Uralmash’s ascension to the top flight in 1969 — football. As many as 34,000 fans are said to have squeezed into the Central for Uralmash’s first match in the Soviet premier league, a 3-2 win over Azerbaijani side Neftchi Baku. In the early years of the Soviet Union in particular, sport played a complex socio-cultural role. More than just a pastime, “physical culture” was meant to play a crucial role in the construction of the so-called “New Man”: an idealised Soviet citizen, worthy of the utopia being built around him. Of course, the New Man was to be a model of physical fitness, but he was also expected to embody socialist traits of selflessness, communitarianism and resolve. 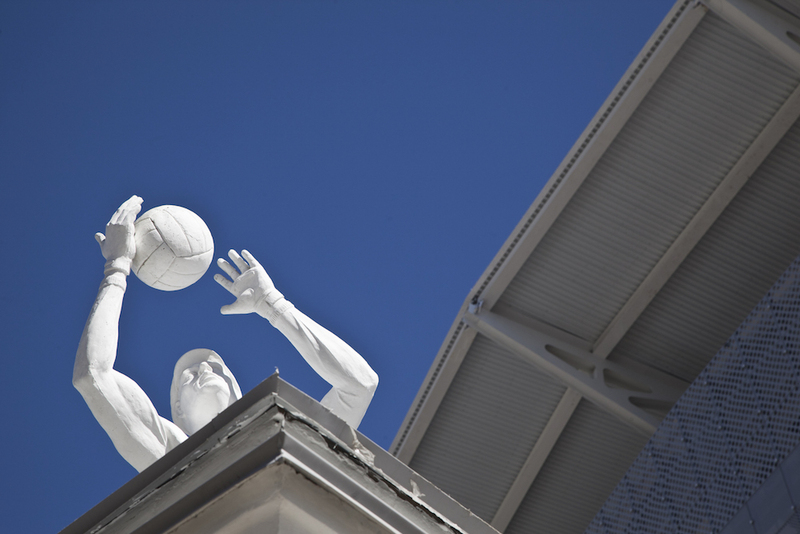 Sports were meant to instil these abstract qualities. From the 1920s until the late 1950s, the Soviet authorities held sport to these lofty standards, and the stadia they built were designed to reflect this. While the stadium itself was a fine example of the conservative, classically-minded tendencies of the late Stalinist regime, its surroundings told a different story. 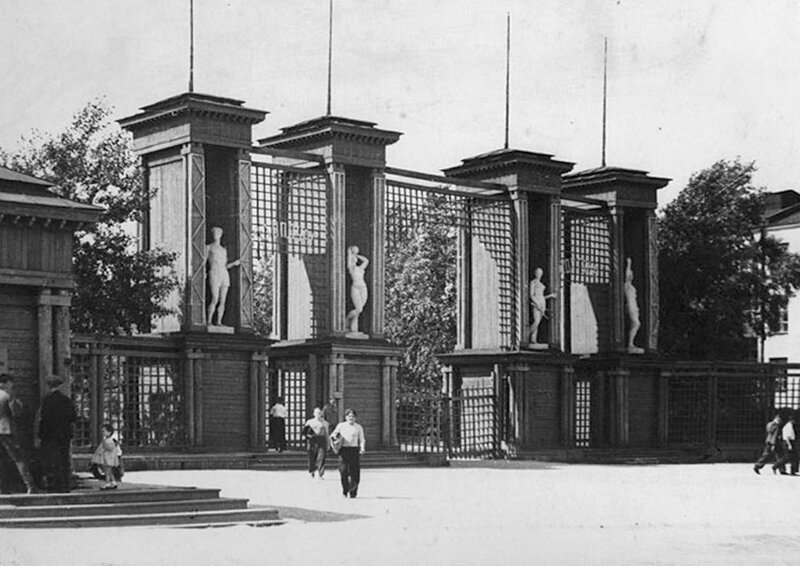 In the early 1930s, the parks around the earlier wooden stadium had been filled with a variety of medical institutes, including one of Russia’s foremost antenatal care units. This cluster of facilities, known as a medgorodok, or medical village, was built in the angular, avant-garde Constructivist style for which early Soviet Yekaterinburg was renowned, and which became politically untenable with the rise of the kind of neoclassicism exemplified by the Central Stadium. And yet these facilities had been built here precisely because of the presence of the stadium — the mish-mash of architectural styles belied an innovative, integrated Soviet approach to public health that understood physical culture as just another facet of healthcare, prevention ensconced alongside cure. 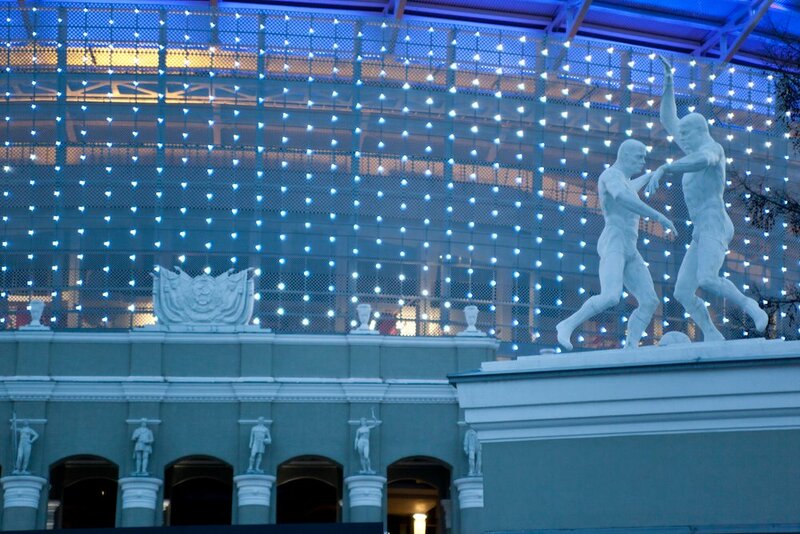 The façade, including the signature eastern portico, has not been removed and relocated, as was initially planned: instead, incongruously but strikingly, it has been incorporated into the giant glass and steel structure of the expanded modern stadium. The low Stalinist bowl now serves as a kind of foundation out of which rises the circular body of the post-modern behemoth. The result, perhaps unintentionally, somewhat sums up contemporary Russia’s relationship to the built environment of the past, a compromise of sorts between Soviet ideological commitment and the rigours of 21st-century development. 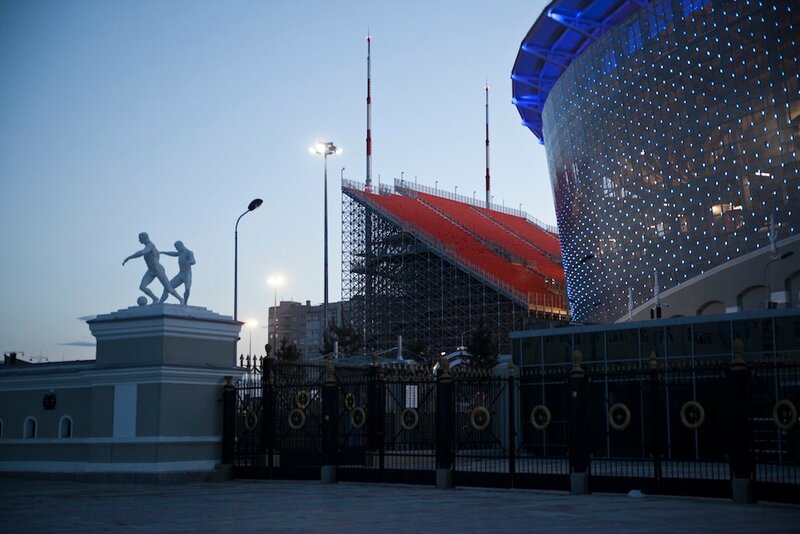 Unlike in other World Cup stadia, visitors to the Yekaterinburg Arena will walk beneath a classically-rendered hammer and sickle insignia, and Stalinist-era sculpture, on their way to watch Japan versus Senegal. This is not the most striking feature of the Arena, though. That honour goes to the temporary stands which jut out from the northern and southern walls of the stadium. When the first images of these triangular appendages were released last year there was a fair amount of amusement online — the incongruity of the DIY-style extensions attached to this high tech stadium was hard to ignore. And yet there is something admirably practical about the stands, which are a simple solution to the need to expand the capacity of the stadium for the duration of the tournament without infringing on the protected sites nearby; it’s the same trick that was pulled by the “water wings” of the Zaha Hadid-designed Aquatic Centre used during the London 2012 Olympics. If the temporary stands lend themselves to meme-ification, then it’s perhaps because they’re in keeping with a certain idea of DIY Russian ingenuity, a can-do attitude that gets the job done whatever the circumstances. Indeed, there’s a great deal of affection for them within the city. And in any case, this latest addition to the stadium is entirely in keeping with the convoluted history of this Constructivist-Stalinist-Classical-Postmodern architectural ensemble.